This idea came from: Soup in a Mug from Gena Flores. Gena said: Getting large coffee cups, have them fill about 1/3 full of veggies, meat etc. and then add a tsp. of chicken or beef bouillon, add hot water and let set for about 4-5 minutes. I saw Gena's idea last week and I loved it. Where I live it is cold. Right now it is 1 degree. When it is really cold like this chicken salad just does not cut it at a party. You need something warm and nourishing. The samples don’t need to be huge but they do need to be worth a trip out into the cold and dark. A make-your-own soup bar is a perfect thing to demo at a party when the weather is so frigid. When we tried this out I found that the soup needed to sit for at least a solid 7 minutes but 10 minutes was even better. Use the wait time to talk about the Q. The first time I tried this I made it for my family. And to be honest my husband made it with the kids because I was having kidney stone issues. My kids and husband LOVED it. They thought it was super fun and they all ate their soup very well. My kids did want to add ton of starch, but after reining them it their soup turned out great. · Group the foods by type: starches, veggies, protein, flavorings. · Put a scoop or spoon in each can/container. A 2 Tablespoon scoop which is (1/8 of a cup) is perfect. Remember when showing your guests how to put their soup together that they need to use the scoop and not their hands. 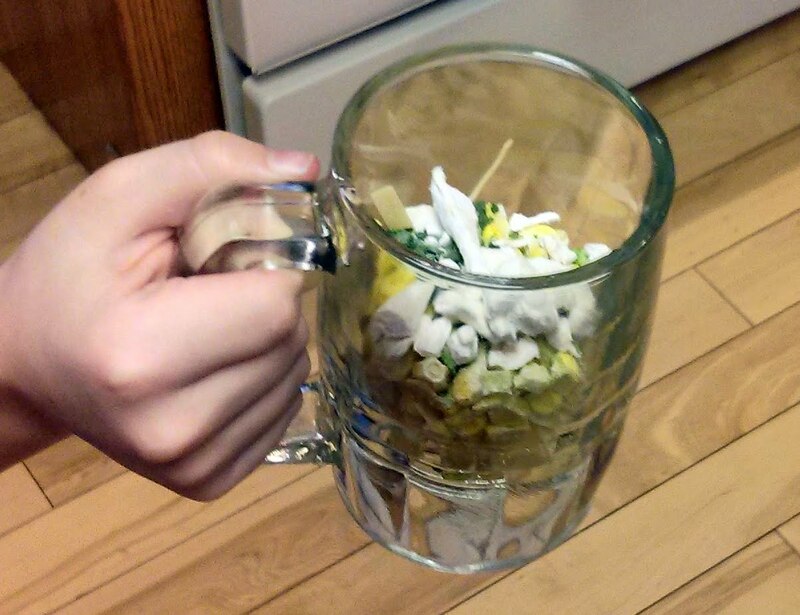 · I used clear glass mugs, and it was a great way to showcase the FD food. Everyone watched everyone else’s cups and they all talked about what items they choose. But you don’t have to use glass mugs. You could also use disposable foam coffee cups, regular coffee cup or mugs of any kind. The mugs I used hold 1 cup (16 oz) and they were perfect. It is always risky to put out open cans of food at a party. If the can is open guests tend to eat a LOT of whatever is in the can. So how do you get around this? Here is what I do. a. Put a scoop in the can. b. Put the lids back on the cans immediately after the guests have dished up their soup. c. Put out pantry cans or pouches instead of number 10 cans. d. Use serving dishes. If you have a limited amount of samples, especially if you don’t have time to replace your samples, put a generous amount in serving dishes. Guests will eat however much is out. e. If you have a guest(s) that are chowing down, no problem be sure to remind them how much they liked it when they are filling out their order form. f. Remind guests that they want their cup 1/3 full (1/2 full max) you need space for the water. Items that worked well: fill cup 1/3 to ½ full of the following then add boiling hot water. Use less then food then you think. 1-2 TBSP of each is enough. Starches: egg noodles, instant rice (we used brown rice), FD Potatoes. Veggies: corn, spinach, and tomato dice, green beans, onions, green onions, celery, green chilies. I did not try every vegetable but all of the Freeze dried ones I tried worked out very well with the exception of the Zucchini. Caution: Broccoli and Cauliflower both worked well but I think they tend to take over the soup since they are both so strongly flavored. I love to demo the broccoli because the taste and texture are so wonderful. In this soup bar they tend to overwhelm the other flavors. *I recommend that everyone put in at least a little onions and celery. Protein: chicken dices, chicken slices, ground beef, beef dices, beef slices, instant black beans. I did not try making any soup with the TVP but I don’t see a reason why it would not work. Flavorings: Add 1 tsp. per mug. Chicken bouillon, Beef bouillon. (I found when we used bullion we did not need to add salt). Tomato powder, pepper, and tabasco (for those that like everything spicy). Remember only 1 teaspoon of these. I love this Heather. Rachel was just telling me about Gena's post today! So happy to hear about your test results with your family too. What a great idea! I'm a consultant out in AZ. My son and I are trying to make chicken noodle soup with this method for lunch. I just might try this at my party next week. Thanks for the idea! I have done a soup bar with my kiddos and they simply loved it... and you are right, they gobble it up - with no complaints about "I don't like such and such" because it was THEM who "designed" their soup! I'll definitely be doing soups at my future parties!! Thanks! Do you find the rice and beans needed more cooking time? or was the boiling water and 7-10 minute wait time enough? Awesome concept, Thanks!! Nicole, the 10 minutes is enough for the rice and beans as long as your water really is boiling. I use an electric tea kettle that boils the water very quickly. But what I have found as I have been doing this at parties is that customer don't want to wait that long. they are anxious to eat. So for my last couple of parties I did not take the rice and beans (which are not good at 5 ish minutes) and just take FD veggies and meat that rehydrate faster. For my last party I took: FD Chicken slices, FD potatoes, FD peas, corn, celery, green beans, onions, and chicken bullion. It turned out great and even when customers ate it before 10 minutes everything was soft and warm, it turned out great.